After our early morning escapade to the fish market, we headed to Ginza, a very commercial district known for its department stores. Mayli in particular wanted to see the Mitsukoshi and Wako department stores. 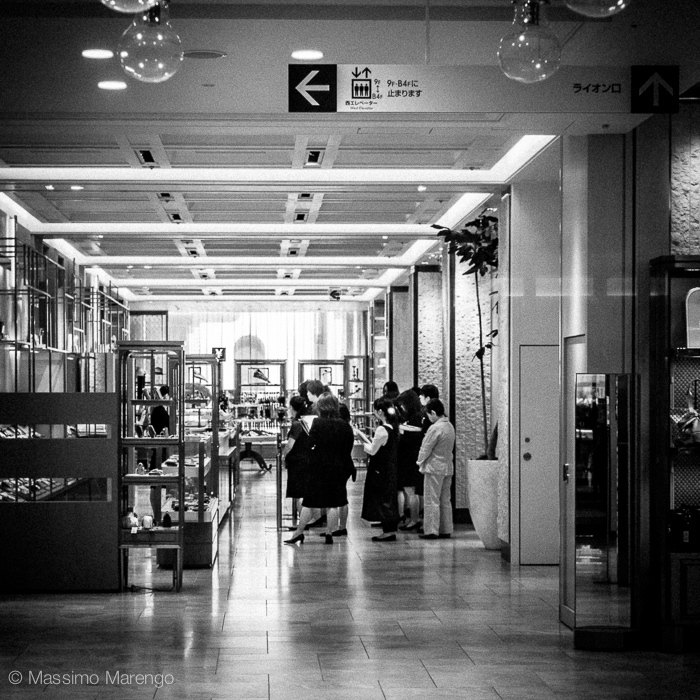 Founded in 1673, Mitsukoshi is the oldest department store chain in Japan. 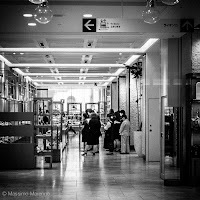 The Ginza branch is not the largest store of the chain (they have a gargantuan flagship store in Nihonbashi), but it is still impressive. The Wako store is similarly large and famous for its clock tower that plays the Westminster chimes at every quarter hour. The highlight of the visit was to wait in front of the store at the opening time, to see the huge crowd squeezing through the door, as if on a daily re-enactment of black friday. Differently than the black friday chaos, however, here the crowd enters very orderly, shepherded by the employees standing at the door welcoming the daily customers. The little photo on the left shows an interesting ritual that happens on every store before opening: the pep talk of the manger to the employee, receiving the instructions for the day. After all this walking we were quite tired, so we decided to eat at the restaurant at the hotel. Without knowing better, we chose what looked like a small tempura restaurant on the back street of the hotel. It turned out to be an excellent surprise: Koromo ended up being one of the best restaurant we found in our whole trip. I had no idea a tempura restaurant could be so sophisticated. The dinner turned out to be not only delicious, but also educational. We sat at the bar (like a sushi bar) and the chef prepared every tempura disk (fish and vegetables) in front of us. He didn't speak much english, but he went out of his way to explain us every dish, what it was and how to eat it. He had a book that he used to show us each kind of fish he was preparing: the pictures in the book were so beautiful that when by chance we found it in a bookstore, we bought a copy even though it was in Japanese. We got lucky in finding Koromo, because the other places in the neighborhood were not quite as sophisticated. 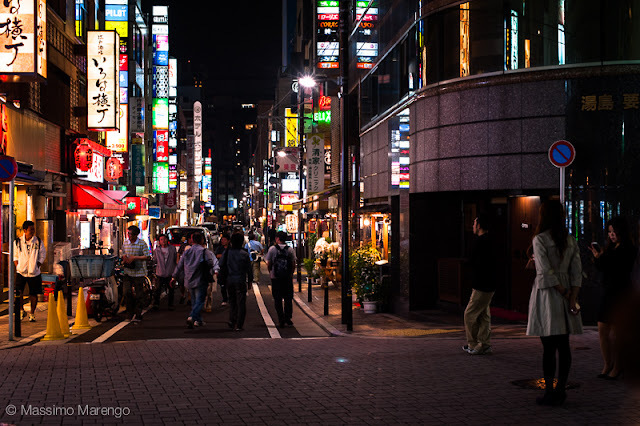 In fact most of the places on that same backstreet were pachinko parlors and "gentleman's clubs", the latter identifiable by the nice ladies standing in front, waiting for suitable customers to entice inside for "a drink" (on the right in the top photo). We Want a Japanese Maple!